In the 5pm EDT half hour Tuesday of CNN's The Situation Room, Jack Cafferty used the hurricane as an excuse to trash President Bush for being on vacation, as if the location of Bush, who already authorized federal action, has any impact on that federal response to the devastation. Cafferty asked host Wolf Blitzer: "Where's President Bush? Is he still on vacation?" Blitzer answered that "he's cut short his vacation. He's coming back to Washington tomorrow." Cafferty snidely contended: "Well, that would be a good idea. He was out in San Diego, I think, at a Naval air station giving a speech on Japan and the war in Iraq today. Based on his approval rating in the latest polls, my guess is getting back to work might not be a terrible idea." A new ABC News/Washington Post poll found that an overwhelming 89 percent maintained Cindy Sheehan's protests have had no effect on their view of the Iraq war, with the remaining respondents split evenly between saying her efforts made them more or less likely to support the war, but you'd be hard know it since, in part thanks to hurricane coverage, ABC's World News Tonight didn't report anything on the poll Monday or Tuesday night while Good Morning America squeezed in a short item Tuesday morning. Wednesday's Washington Post didn't get to the Sheehan finding until the next to last (24th) paragraph of a story headlined, "President's Poll Rating Falls to a New Low: In Post-ABC Survey, 53 Percent of Respondents Say They Disapprove of Bush." Some in the media have blamed the ferocity of Hurricane Katrina on global warming. NBC's Robert Bazell warned on Monday's NBC Nightly News, in a story carried repeatedly on MSNBC, that "many scientists say we can expect such storms more often as global warming increases sea temperatures around the world." In a Monday posting on Time.com. Jeffrey Kluger forwarded that "to hear a lot of people tell it, we have only ourselves -- and our global-warming ways -- to blame." Kluger conceded that "hurricanes were around a long, long time before human beings began chopping down rainforests and fouling the atmosphere," but he concluded that in the future global warming "could make even Katrina look mild." Former Washington Post and Boston Globe reporter Ross Gelbspan, in a Tuesday Boston Globe op-ed, charged: "The hurricane that struck Louisiana yesterday was nicknamed Katrina by the National Weather Service. Its real name is global warming." In contrast, the New York Times remarkably reported Tuesday: "Because hurricanes form over warm ocean water, it is easy to assume that the recent rise in their number and ferocity is because of global warming. But that is not the case, scientists say." CNN's Cafferty Takes Shot at Bush's "Vacation"
Setting up his 5pm EDT hour "question" for his "Cafferty File" segment, Cafferty, in Manhattan, opined about the condition of New Orleans: "They've been living on borrowed time. You have to wonder, watching these pictures, and listening to these accounts, if we'll ever see the city of New Orleans as we all remember the Big Easy. Where's President Bush? Is he still on vacation?" Blitzer, in Washington, DC, answered: "He's cut short his vacation. He's coming back to Washington tomorrow." Cafferty: "Well, that would be a good idea. He was out in San Diego, I think, at a Naval air station giving a speech on Japan and the war in Iraq today. Based on his approval rating in the latest polls, my guess is getting back to work might not be a terrible idea. That's not the question of this hour, however." Cafferty proceeded to set up and announce his hourly question: "Before Hurricane Katrina made landfall, the mayor of New Orleans ordered a mandatory evacuation of the city, told 1.3 million people to get out of town. But a lot of people either ignored the order or were unable to evacuate. And now a lot of them are trapped in their flooded homes or worst. The fear is a lot of them are dead. The thousands who wound up spending the night in the Superdome had an uncomfortable stay. They lost the air conditioning. They lost part of the roof. But they're alive today. The question is this: When the government orders mandatory evacuations, what should be done about people who either can't or won't leave? Caffertyfile@cnn.com. We'll read some of your letters in a half-hour or so." In the 7:30am half hour of the August 30 Good Morning America, news reader Claire Shipman noted: "Mr. Bush is in San Diego today where his focus continues to be bolstering public support for the war in Iraq. A new ABC News/Washington Post poll shows the campaign by Cindy Sheehan has had little effect on public opinion about the war. 79 percent say they haven't been swayed by the Gold Star mom. And the public seems evenly divided on the question of whether Mr. Bush should meet again with Sheehan." No effect on views: 79%"
Second: "Should Bush meet with Sheehan? 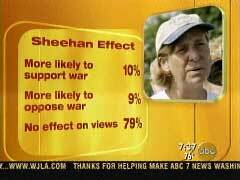 "The poll found that Sheehan's activities may have helped increase support for the war among Bush supporters. Although eight in 10 Americans said Sheehan's protests have not changed their attitudes toward the war, one in 10 said she has made them more likely to support the conflict -- the same proportion that said she has made them less likely to support the war." "Is Global Warming Fueling Katrina?" asked the headline over an August 29 "Web exclusive" posted on Time.com. The subhead summary: "Warm ocean temperatures are a key ingredient for monster hurricanes, prompting some scientists to believe that global warming is exacerbating our storm troubles." The people of New Orleans are surely not thinking about wind vortices, the coriolis effect or the dampness of the troposphere as they hunker down during hurricane Katrina this morning. They're mostly thinking about the savage rains and 140 mph winds that have driven them from their homes. But it's that meteorological arcana that's made such a mess of the bayou, and to hear a lot of people tell it, we have only -- ourselves and our global-warming ways -- to blame. So is global warming making the problem worse? Superficially, the numbers say yes -- or -- at least they seem to if you live in the U.S. From 1995 to 1999, a record 33 hurricanes struck the Atlantic basin, and that doesn't include 1992's horrific Hurricane Andrew, which clawed its way across south Florida in 1992, causing $27 billion dollars worth of damage. More-frequent hurricanes are part of most global warming models, and as mean temperatures rise worldwide, it's hard not to make a connection between the two. But hurricane-scale storms occur all over the world, and in some places -- including the North Indian ocean and the region near Australia -- the number has actually fallen. Even in the U.S., the period from 1991 to 1994 was a time of record hurricane quietude, with the dramatic exception of Andrew. Just why some areas of the world get hit harder than others at different times is impossible to say. Everything from random atmospheric fluctuations to the periodic warming of the Pacific Ocean known as El Nino can be responsible. But even if all these variables have combined to keep the number of hurricanes worldwide about the same, the storms do appear to be more intense. One especially sobering study from the Massachusetts Institute of Technology found that hurricane wind speeds have increased about 50% in the past 50 years. And since warm oceans are such a critical ingredient in hurricane formation, anything that gets the water warming more could get the storms growing worse. Global warming, in theory at least, would be more than sufficient to do that. While the people of New Orleans may not see another hurricane for years, the next one they do see could make even Katrina look mild. The Globe identified Gelbspan as "author of The Heat Is On and Boiling Point." The full name of one of those books, Boiling Point: How Politicians, Big Oil and Coal, Journalists and Activists Are Fueling the Climate Crisis -- And What We Can Do to Avert Disaster. From the Publishers Weekly summary as posted by Amazon.com: "Gelbspan, a Pulitzer Prize'€"winning journalist, offers no less than a call to arms in this treatise on how global warming is a threat and how it can be avoided. Gelbspan expands the argument about global warming: not only is the current U.S. administration to blame, but journalists and activists are as well. Journalists, he says, are culpable because they are minimizing the story; activists, while well-meaning, are so busy trying to form alliances and make compromises that they lose sight of a problem that Gelbspan believes could ultimately compromise the planet. Gelbspan writes clearly, and he argues that Republican members of Congress have latched onto theories of the few scientists who don't believe that global warming is a major problem...."
In fact, Gelbspan never won a Pulitzer Prize. He was an editor at the Globe for a series for which several reporters won a Pulitzer. Ross Gelbspan retired several years ago after a 31-year career in journalism as a reporter. As special projects editor of The Boston Globe, he conceived, directed and edited a series of articles that won a Pulitzer Prize in 1984. In 1995, he co-authored an article on climate change and the spread of infectious disease which appeared in the Outlook Section of The Washington Post. His article on climate change, which appeared on the cover of the December, 1995 issue of Harper's Magazine, was a finalist for a National Magazine Award. In 1997, he published a book on the global climate crisis titled: The Heat Is On: The High Stakes Battle Over Earth's Threatened Climate (Perseus Books). The book has also been published in German, Italian and Portuguese. (An updated U.S. paperback edition was published in 1998 (Perseus Books), as: The Heat Is On: the Climate Crisis, the Cover-Up, the Prescription). The book received very positive reviews in the New York Times, Los Angeles Times, Boston Globe, Minneapolis Star-Tribune, the science journal, Nature and elsewhere. It was excerpted in The Washington Post, the San Jose Mercury and other outlets. It received national attention that summer when President Clinton told the press he was reading The Heat Is On. Since the book's publication, Gelbspan has appeared in numerous radio and television interviews, including "Nightline," "All Things Considered" and "Talk of the Nation." He was invited to the World Economic Forum in Switzerland in February, 1998, where he addressed government ministers and leaders of multi-national corporations. Over the course of his career, Gelbspan worked at The Philadelphia Bulletin, The Washington Post, the Village Voice, Scripps Howard, where he was a national news editor, and The Boston Globe. He has also taught at the Columbia University School of Journalism. In 1971, he spent a month in the Soviet Union interviewing Soviet dissidents and human rights advocates. His four-part series on the Soviet underground was reprinted in the Congressional Record. In 1974, he edited a book for Scripps-Howard on the Congressional Watergate Committee hearings. In 1979, the Boston Globe hired Gelbspan as a senior editor. In his capacity as special projects editor, he conceived, directed and edited a series of articles on job discrimination against African-Americans in Boston-area corporations, universities, unions, newspapers and state and city government. The series won a Pulitzer Prize in 1984. Boston Globe reporters Ross Gelbspan and Dianne Dumanoski tried to panic the Eastern seaboard with a May 31-June 2 series that began with a newscast from 2030: "Food riots erupt in Boston... Nature helps avert a water war between New York and Pennsylvania ...Garbage dumping begins in the Grand Canyon...Red Sox game smoked out in Chicago [by Saskatchewan prairie fires]...Scenarios like these are being forecast by more and more scientists. Unless skyrocketing rates of pollution and population growth are reduced soon, they warn, many biological systems needed to sustain humans will collapse within the lifetimes of today's children." The Globe did devote a small box to critics. Wrote Gelbspan: "These voices are increasingly in the minority. And as evidence has accumulated, the tide of the debate has swung increasingly toward those who believe that the Earth's ability to withstand untrammeled human activity has reached the breaking point." Gelbspan quoted greenhouse promoter Stephen Schneider: "It is journalistically irresponsible to present both sides as if it were a question of balance...It is irresponsible to give equal time to a few people standing out in left field." Gelbspan ignored a Gallup poll of 400 climate experts from the American Meteorological Society and the American Geophysical Union. While 60 percent agreed global temperatures rose in the last century, only 19 percent believed that warming was induced by human activity. Nobody reported that. FNC's Special Report with Brit Hume on Tuesday also took on the 'global warming caused Katrina theory,' bringing aboard University of Virginia environmental sciences professor Patrick Michaels. The MRC's Brad Wilmouth corrected the closed-captioning against the video. Brit Hume: "A writer in the Boston Globe today declared that the hurricane that has wreaked such damage along the Gulf coast may be called Katrina, but it's real name, he said, is global warming. Journalist and author Ross Gelbspan noted that Katrina began as a minor hurricane, but that was before, quote, 'it was supercharged with extraordinary intensity by the relatively blistering sea surface temperatures on the Gulf of Mexico,' which he says were, or suggests, were a consequence of global warming. Let's ask Patrick Michaels, senior fellow in environmental studies at the libertarian CATO Institute and a professor at the University of Virginia, about all of this. He joins me from Charlottesville, Virginia....What about this idea that we had a minor hurricane, drifted across Florida with little damage, and then got reheated by the very hot water in the Gulf of Mexico into this catastrophic hurricane?" Prof. Patrick Michaels, University of Virginia: "Well, first off, all major hurricanes start as minor hurricanes. Secondly, Ross Gelbspan put forth a very testable scientific hypothesis, didn't he? He said that as sea surface temperature goes up, hurricanes will become more extreme. Well, you can take a look at data for the Atlantic Basin for the last 50 years, and you'll find that only 10 percent of the variation in hurricane strength and frequency from year to year is related to sea surface temperature. In other words, 90 percent of the changes in hurricanes -- weak years, strong years, not very many, years with a lot, -- 90 percent of that variation is due to factors other than sea surface temperatures." Hume: "Well, what kind of factors are we taking about?" Michaels: "Well, whether or not there's an El Nino, for example. You know, that's that big temperature reversal out in the Pacific that causes all kinds of news stories." Hume: "Does that have anything to do with global warming, by the way?" Michaels: "Well, that's a very interesting point. A lot of scientists, not necessarily me, think that El Nino frequency would go up if there was global warming. Well, El Nino is poison to hurricanes. It induces westerly winds over the Atlantic Ocean, and westerly winds kill hurricanes. That's one of the reasons why sea surface temperature is not this big explanatory variable. And you know what? There's another way to test this pretty grossly. The world's surface temperature has gone up over the last few decades, not as much as a lot of computer models forecast, but it's gone up. So ask yourself the question: Has the number of hurricanes, meaning tropical cyclones, around the world gone up? In other words, does global warming increase global hurricanes? And you will find that there has been no statistically significant change whatsoever in the number of global tropical cyclones." Hume: "Well, I think people living in this country who have vivid memories of hurricanes such as Andrew and others have the sense, at least, that we have had an increase in these killer hurricanes, that they seem more frequent in recent years particularly, this year there seems to have been a lot of them, and they might be tempted to believe that, well, you know, something's causing this, why not global warming? Now, you've suggested one reason why not, but what about it?" Michaels: "Well, again, the problem is when you do science and you make hypotheses, you got to test global temperatures against global hurricanes, not against Atlantic hurricanes. Yes, Atlantic hurricane frequency has increased since the late 1990's, but the fact of the matter is it was quite low for several decades, ending about 1995, 1998, or so. We were below the long-term mean for several decades. We've now come up to run above the long-term mean, and when you add several years of below and several years of above, you know what you get, Brit? Average!" Hume: "Right, I understand. So is that where we are, I mean overall for the, it's fair to say that this increase in global temperatures has been building over the past five decades or so, correct?" Michaels: "That's right. And you don't see a concomitant change in the trends in global tropical cyclones." Hume: "So then where would one look then to try to figure out what's the cause of this recent spate of Atlantic hurricanes?" Michaels: "Well, there's a temperature fluctuation in the Atlantic that is well known, known as the North Atlantic, well known to nerds like me, excuse me, Brit, called the North Atlantic Oscillation. That's in a phase that seems to be promoting hurricanes. But, you know, these numbers, again, like only 10 percent of the variation in Atlantic hurricane strength and frequency is related to the sea surface temperature. That tells you something. Even if you're going to warm up the planet, and we are, and I wish we could say we could stop it, but we can't." Michaels: "What's going to happen is that the signal of increased hurricanes will take forever to emerge from those very noisy year-to-year fluctuations if the sea surface temperature only explains 10 percent, and by then, we might not even be burning fossil fuel."